Our jaw-joint is called the “temporomandibular joint”, or TMJ for short. It is in many ways very unique. Our lower jaw is the only bone in the body that is “hinged” at both ends to the skull and has an endpoint of closure, namely where the teeth contact. The function of the jaw is very intricately balanced by a wide number of muscles and ligaments and certainly governed by a very deep-rooted voluntary and involuntary nervous system. The whole system, called the “stomatognathic” system, has to work in unison to avoid disharmony. A disruption of this delicate coordination causes TMD or temporomandibular joint dysfunction. TMJ problems have been linked to head and neck pain, posture problems, migraines, and earaches. In fact, a lot of the symptoms stemming from TMJ discomfort are located in the neuromuscular apparatus associated with the joint. As these are also connected to the rest of the facial, neck and back musculature, as well as muscles in posture regulation, there may be far-reaching repercussions. TMJ dysfunction is usually not caused, but may be aggravated by poor dental restorative work. 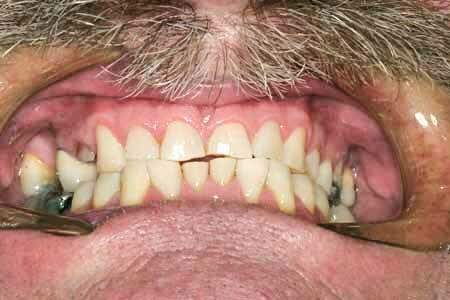 Narrow or underdeveloped arch with tooth crowding and disharmonious occlusion. Cranial misalignment or joint damage from a past traumatic experience. Past orthodontic therapy coupled with extraction of sound teeth to create space. Excessive dental wear or tooth loss with resulting loss of vertical clearance between upper and lower jaws. Phase I: Stabilizing the jaw-joint to release tension and reduce inflammation. This usually involves fabrication of daytime and nighttime splints, craniosacral or chiropractic manipulation, and naturopathic and homeopathic treatment. Phase II: Once the symptoms have quieted down and a stable physiological position has been established for the jaw, which is conducive for its healing, a permanent solution is negotiated with the patient. This may include orthopaedic/orthodontic therapy and/or full mouth reconstruction, in case multiple teeth need restoring. The main idea is to attempt to restore or develop the teeth to function at the most physiological position of the jaw.